happy feburary! i perform a lot of beauty services weekly and what i hear most from clients is their struggle to find the right skin care line. selecting the right skin care line is a lot like finding the perfect black dress – there are so many out there, but only one will fit you perfectly. after reading this be sure to head over to r-beauty-block on how to purchase products for your skin. do you know your skin type? before purchasing an over-the-counter skin care product line (which i don’t recommend if you’re looking for real results) there are a few facts that you need to know. it doesn’t matter whether skin is dry, oily or sensitive, selecting the wrong product could greatly impact how the product interacts with your skin. 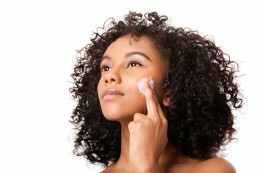 start a daily skin care routine: to have success with most skin care products is being repetitive with the process. creating a daily routine is highly recommended and important, especially with anti-aging creams. please do not get discouraged – be patient. usually it may be six to eight weeks before you can see improvements with over-the-counter remedies. be cautious of the “instant” products: products that seem “too good to be true” probably are. stick with a reputable line, which will be the best bet and more effective and safe. do your homework: before purchasing products – read the labels to find the active ingredients. it’s okay to look up the ingredients and to also ask questions to a skin care professional. use sunscreen: skin should be protected from the sun is important. be sure to purchase beauty moisturizers and/or creams that contain at least SPF 30. this will help to maintain your skin’s youthful appearance by reducing the appearance of age spots, fine lines and wrinkles. 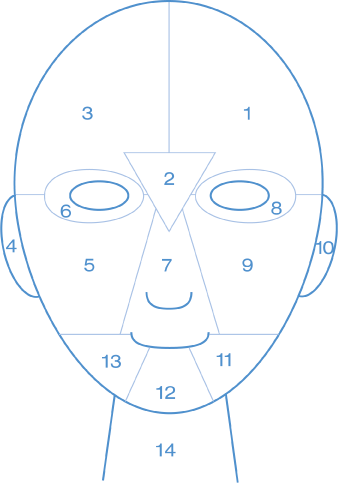 Face Mapping, is Dermalogica’s unique skin analysis that provides insight into your skin’s past and present, and allows the subsequent prescription of a targeted home care regime for a healthy skin future. when i was in school for esthetics, I was trained with dermalogica. maybe this has something to do with them being my favorite skin care line. however, the product is great and i highly recommend you trying it. be sure to head over to the r block on how to start investing in a skin care line. it’s very tempting to buy skin care products because of their nice packaging, luring advertisements, friendly sales reps or celebrity endorsements. but, the main factor in selecting a skin care line always comes down to one major factor: what is in the bottle – the ingredients – because that’s what will create results for your complexion. here is my guide to assist you with picking out skin care products. it’s best to go in to buying a skin care product knowing what active ingredients are proven to address your skin issues and then look for products containing those ingredients. your skin care products should contain active ingredients that are safe and highly effective, but they should have high enough concentrations that the ingredient is actually effective – usually in the 5-15% range. the active ingredient should be listed at or near the top of the ingredient list. if it is at the bottom of the list then it’s a small component of the product. this means the active ingredient is not in a high enough concentration to make much of an impact on your skin. how will do you know the oils. products that contain phthalates and synthetic chemicals are commonly used to stabilize fragrances and make plastic more pliable. these chemicals are known to be endocrine disrupters and can mimic hormones and may alter genital development. unless a label states that the fragrance listed was derived from an essential oil – don’t purchase the product. parabens are used to preserve other ingredients and extend a product’s shelf life. parabens are antimicrobial chemicals that have been linked to having hormone-disrupting effects. also, they cause skin irritation and can increase the risk of breast cancer. made from crude oil. petroleum-based ingredients such as petroletum, mineral oil, baby oil and paraffin form a barrier when applied to the skin that does not allow it to breathe and clogs pores. petroleum is NOT a moisturizer. it does not hydrate or add moist to your skin. in fact, it does the reverse. common sulfates are sodium lauryl and sodium laureth. they are harsh detergents that give cleansers, soaps, and shampoos their latherability. sulfates are made from petroleum. sulfates are used as garage floor cleaners, car wash and oils for cars. sulfates are extremely pore clogging. the mass-merchandised brands(neutorgena, noxzema, olya) sold at drugstores are created to work for hundreds of thousands of users. these lines play it safe with lower concentrations of active ingredients and adds a lot of fillers, synthetics and parabens, which can keep costs low and extend the shelf life. products sold at department stores have one goal in mind – is to sell! these companies know they have to catch your eye when you walk down the department store aisles. Also, these companies know that people will open and smell the products, so they use a lot of perfume additives because they know that smell sells! fragrance is the number one cause of reactions from skin care products. the truth of the matter, many people who believe they have sensitive skin are in fact just sensitive to added fragrance! I have two 17yr olds who are both struggling with bad facial acne. I’m bringing them both to your office so we all can experience a good facial for the first time. From there, I would like to start learning about how we can better care for our skin. Look forward to meeting you soon. Also, I follow you on Facebook and Instagram. Thanks for sharing so much with us. Hey Shaniya!! Thank you for reading the blog! The key to having clear skin is to keep our hands from off of our faces! Our hands harbor so many different germs that can cause irritation to our faces. Also, having a day and night time facial regimen is important as well. I look forward to meeting you soon!! Take care!